Sixty seconds later, the video had been returned to its drawer, and the class was sitting up straight, staring at both Myna’s blue velour running suit and the lavender scarf on her head, while Tziporah introduced her as a brave woman who had seen the kinds of things she prayed every night we would never know, but about which she had to make sure we knew, which is also why we’d been watching that awful movie. I started clapping. I didn’t mean to, but I thought it wasn’t absolutely impossible that she was done. There wasn’t all that much left to the story. Everyone turned and looked at me, so I stopped. But I could see from their eyes my clapping was the first interesting thing that had happened all class long. I clapped again. Only four claps this time because Tziporah gave me the Major Screw Eye. Fortunately, no one appeared to be listening. She was warming up. That last remark was a bad sign. Any minute now she was going to tell a Jewish joke. The world was about to find out that my grandmother, the Holocaust survivor, told Jewish jokes. But maybe she was done. There was no way anyone was going to ask a question. Sarah Glickman raised her hand. I wanted to chop it off. Where was our broadsword when I needed it? “Did you keep in touch with everyone after you got here?” she asked. It was my impression that a dozen or so family members made the journey, though neither names nor exact numbers were ever made clear because the entire group wound up scattered across the country. We were never in contact with any of them, and Myna never talked about her relatives except to say they didn’t get along. Sarah had no follow-up question, thank God. I prayed we were finally done, but someone else asked what Myna and Nathan did when they got to Pittsburgh. Damn you all! I wanted to scream. You don’t care! “Some money, we still had,” Myna explained. “We open a new general store in thirteen months, if you can believe! My son, Michael—he was born in 1944, but my Nathan died from cancer in the liver just a year later, so I run the business myself and raise him there. But then, many years later, I finally married to Jon’s grandfather, Leon. I stood up and clapped like crazy. Show over. I sat down. Myna winked at me. She was having a grand time. “Did you say you married Jon’s grandfather?” someone asked. All at once, the entire class un-slouched. Oh, we had buy-in now. Engaging curriculum! “What is this word?” Myna asked. No one had the guts to define it for her. I scanned the room. The door was blocked by too many desks. I could hurl myself through the window, though. Myna had asked this “question” during dinner at our house a week earlier and almost made my father raise his voice. While Dad was famous for his opposition to religion, he had nothing against religious people in general, and certainly nothing against Jews in particular. He couldn’t fathom why someone who’d gone through the things Myna had would ever tell such jokes. More amazing was the fact that Leon, who’d apparently tolerated nothing in the way of either rudeness or a sense-of-humor in raising my mom, never objected to these outrages. Apparently, the night Myna met Leon (they both chaperoned the blind date my parents went on as freshmen at Pitt), she watched him puff on his cigar after picking them up in his broken down Dodge and asked him how many Jews fit in the new Mercedes-Benz. And five hundred in the ashtray. Leon evidently didn’t laugh, or even smile, but he also didn’t spend the rest of the date browbeating Dad into never asking his daughter out again—something he did to every other date she’d ever had, not that he’d permitted many. My parents were mortified from the start that night, but also falling in love. None of my classmates responded to Myna’s query about wandering Jews. This was worse than a boring story. Tests were for real school. Tziporah surveyed us, angrily. I wondered if I should throw myself on the floor and simulate a seizure. Anything. I couldn’t, and despite years of instruction, I was willing to bet most of the rest of the class couldn’t either, but that was beside the point. “But she doesn’t actually want the real—” I started to protest. Absolutely wrong! I wanted to shout. And I wasn’t pretending! “Oh, he knows all right,” Myna said. She was smiling ear- to-ear. The whole class was looking at me. Now I was defying my teacher and my own grandmother. Finally, I mumbled something unintelligible under my breath. Everyone gaped at me. Then they all turned as one to see how Tziporah was going to react. My teacher rose from her chair like a column of black, smoking death. She flew at me in a fulminating rage, then dragged me to the hall by my right armpit, which I assumed was some secret Israeli army maneuver. I caught a glimpse of a genuinely surprised look on Myna’s face as I was manhandled past her. In the hall, Tziporah berated me for fifteen minutes about my blatant disrespect for my grandmother, not to mention six million murdered brothers and sisters of mine, for my clear manifestation of something called the “Self-hating Jew Syndrome,” and for trading my obvious academic potential for a jester’s cap. I had no choice but to tell her Myna was not actually quizzing the class on its level of biblical scholarship, but that only made her skull appear dangerously close to exploding. A burst of laughter came from the classroom, snapping Tziporah out of her conniption. She shoved me back into the room just as Myna was thanking my classmates for their attention. I threw myself into my seat with a huff. The class giggled. Tziporah looked confused. She managed some polite clapping that was a signal for us to do the same. Myna bowed slightly and flashed me a wink. Tziporah, somewhat regrouped, asked the class to share what they’d learned. reprinted with permission. 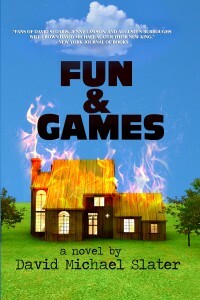 Fun and Games is available on Amazon, Barnes and Noble, the Library Tales Publishing website and elsewhere. For more about David Michael Slater, www.davidmichaelslater.com. 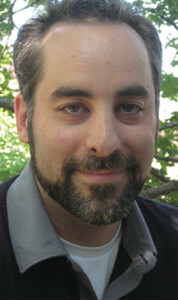 David Michael Slater is an award-winning author of books for children, teens, and adults. His books include Cheese Louise!, Flour Girl, Ned Loses His Head, and the controversial teen series, Sacred Books, which is being developed for film. David teaches in Reno, Nevada, where he lives with his wife and son. You can learn more about David and his work at www.davidmichaelslater.com.